As life progresses we acquire items of all shapes and sizes. Often, when these items outlast their usefulness, they up in the garage. A messy garage can create frustration and potential hazards. Now is the perfect time to clear the clutter in preparation of warmer weather and summer fun – a time when surfboards, swim gear and camping equipment are put to use! Organizing a garage can be done in stages, but first things first: Make a plan! 1. Divide the garage into zones: storage, charity, garage sale and trash. To help streamline the process and keep items safe during the process, call PODS® to deliver a PODS® container right to your garage door. 2. Loading the PODS® container at ground level is easy, so work at your own pace. The garage didn’t become cluttered in one day so don’t expect reorganization to take place in one day, either. 3. Consider using garage organization systems to organize tools, sporting equipment, lawn and gardening tools. 4. Once the garage is organized, set ground rules for ongoing maintenance such as keeping the parking area clear and putting tools and sporting equipment back in assigned places after use. A garage free from clutter offers a setting for weekend or school projects with the kids and an opportunity to bond with family and friends. For more information, visit PODS.com. Moving is stressful for families. In some cases the home you are leaving is the only existence your child has ever known. It can be daunting, especially to little people, to say the least. Tell your child(ren) as soon as you know you’re moving; don’t spring it on them at the last-minute. Give them time to adjust and expect tears and fears. Explain why you’re moving in terms they can understand for their age. Do you need more room? Are you relocating because of a new job? If moving to a new city or state, go to websites that offer visual photos of the new community. You also can write to the local chamber of commerce or government offices and request printed materials to read with your kids ahead of time. Share photos and floor plans of your new home if possible and plan for the future as a family. Remain positive, even if you have fears yourself. Be sure and pack lots of games, books or DVDs to keep children occupied if you are in for a long drive. Buy a new backpack or tote and put their favorite things inside. This way, they won’t have to look far to find items that bring comfort when you get to your new home. 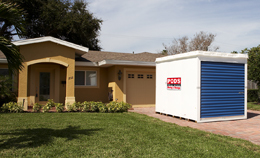 PODS understands moving is stressful and offers flexible pick-up and delivery of its PODS containers when it is most convenient for families. Once your PODS container is delivered, keep it as long as needed to pack at leisure. When you’re done, simply call and schedule pickup and your belongings will be delivered to your new home on the day you specify. PODS, The Best Moving & Storage Idea EVER! Visit PODS.com today for more information.